A male dog, which was allegedly brutalised and gang-raped by four men in Malwani area of Malad West, died during medical treatment on Friday. The canine had to be admitted to a veterinary hospital for treatment after sustaining severe injuries at the hands of the four accused. 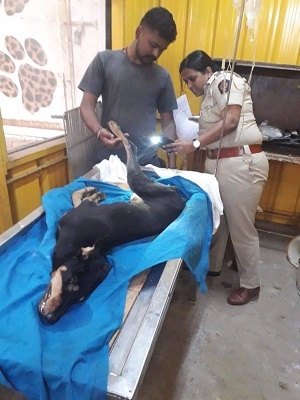 The dog had sustained serious injuries as his private parts had been mutilated by the accused, who were allegedly intoxicated when they assaulted the poor animal. The incident came to light when local resident named Sudha Fernandes, who regularly fed this dog, saw him lying in a pool of blood near a church. When she kept food near him, he was howling in pain and did not allow anyone to touch him. According to reports, a rickshaw driver had seen this dog being sexually abused. He told Fernandes that four unknown accused raped this dog. The rickshaw driver caught the men red-handed when he heard the painful howls of the dog when the men were brutalising him but they ran away as he approached them. After this incident an animal welfare organisation took the dog to a veterinary doctor. Traumatised by the assault, the dog started howling when anyone went near him. Due to heavy bleeding and internal organs exposed, his body had caught infections. NGO founder Dr Anika Pathak said that the dog was seriously injured. His legs and private parts were wounded to a point that medication could not help him. He died on the third day of the treatment in the hospital.